The Green Horse of Revelation Six! Wherever the White Horse and his rider have gone, the Red and Black horses have followed, with the GREEN Horse and his rider tagging along in the rear with hell or the grave as his companion. DEATH and the GRAVE were the natural results for those who refused to partake of the heresies of the Green Horse! Death is the trademark of the GREEN HORSE -- just as death is the trademark of Islam. "When he opened the fourth seal, I heard the voice of the fourth living creature saying, “Come and see.” And I looked, and behold, a PALE [GREEN] HORSE. And the name of him who sat on it was DEATH, and HADES followed with him. And power was given to them over a fourth of the earth, to KILL WITH SWORD, with HUNGER, with DEATH, and by the BEAST OF THE EARTH" (Revelation 6:7-8). The book of Revelation is of great importance in that it provides spiritual strength and insight for YEHOVAH’s people. It highlights YEHOVAH’s interest in the church (ecclesia) of His people and the close and loving care that Yeshua the Messiah exercises toward them as the Shepherd of Israel. Yeshua knows exactly what conditions prevail and what must be done. This is especially manifest in the first three chapters of the book. Some people view Revelation as being so highly symbolic that it cannot be understood -- or they take little care in interpreting it to come up with fantastic and erroneous results. But YEHOVAH God wants His people Israel to understand, and He caused the Bible to be written to be understood and to provide guidance for them. The KEY to understanding Revelation is the same as the key to understanding other parts of the Bible -- YOU MUST USE THE BIBLE TO INTERPRET THE BIBLE! If we search the Scriptures we will find in them the things used as symbolisms in Revelation. By comparing these Scripture texts we can understand what the Revelation symbols mean. The apostle John was steeped in the Old Testament and draws on the rich evocative imagery of the prophets. He knew -- as certainly as Isaiah, Jeremiah, Ezekiel and Daniel knew -- that what he wrote was directly given him by YEHOVAH God and stamped with His authority. So with this mind, let us delve into one of the most mysterious and awesome subjects of the book of Revelation -- the Green Horse of Revelation 6! To correctly understand this portion of the book of Revelation, we need to learn the significance of the horse as a Biblical symbol. For this information we must turn to the Old Testament; for the horse is not mentioned in the New -- except in Revelation. A study of the Old Testament will show that the horse is first of all the symbol of strength, might, or force of a certain kind for conquest and for progress. Characterized as he is by strength combined with speed and fearlessness, the horse aptly symbolizes that form of spiritual vitality and power that sustains, energizes and carries forward -- despite all that opposes it. It represents a GREAT SPIRITUAL MOVEMENT, whether good or evil. The horse especially typifies strength and courage for conflict. "Have you given the horse strength? Have you clothed his neck with thunder? Can you frighten him like a locust? His majestic snorting strikes terror. He paws in the valley, and rejoices in his strength; he gallops into the clash of arms. He mocks at fear, and is not frightened; nor does he turn back from the sword" (Job 39:19-22). "He devours the distance with fierceness and rage; nor does he stand firm, because the trumpet has sounded. At the blast of the trumpet he says, “Aha!” He smells the battle from afar, the thunder of captains and shouting" (Job 39: 24-25). “Then Moses and the children of Israel sang this song to YEHOVAH, and spoke, saying: ‘I will sing to the LORD, for He has triumphed gloriously! The horse and its rider He has thrown into the sea!’” (Exodus 15:1). From this we get the distinct idea that the horse represents the progress of some great enterprise backed by strong military power. Therefore, anything that is pictured in the Bible as being carried forward by a horse is a movement that is sustained by mighty power -- one that advances into conflict against the opposing forces with fearlessness and with prospects of success. Other passages in the Bible reinforce this concept. Notice Isaiah 31:1 (note the words, “rely on horses...because they are very strong”); Jeremiah 4:13 (”His horses are swifter than eagles”); Jeremiah 12:5 (”how can you contend with horses?”); Hosea 14:3 (”We will not ride on horses”) and Psalm 33:17 (”Neither shall it deliver any by its great strength”). When we take into consideration the significance of the horse as a Biblical symbol -- as well as other factors -- it becomes apparent that the Red Horse of Revelation 6, and its rider, presents a prophetic picture of the results of the MIGHTY SPIRITUAL INFLUENCES, agencies or powers, which were to arise and go forth to the twelve tribes of Israel in dispersion at the beginning of the “Christian Era” -- and which were to impart to that era those special characteristics whereby it is set apart from all previous periods in the history of YEHOVAH's people Israel. That our era is clearly set apart from the eras that preceded it, that it has various characteristics which are all its own, and that its most distinctive features are due entirely to influences which came into being at -- and immediately after -- the death and resurrection of Yeshua the Messiah, are FACTS that cannot be denied! By common acclamation this age is known as the “Christian Era” and its civilization is commonly termed “Christian Civilization.” Throughout the world its system of reckoning time has the date (although incorrect) of the birth of the Messiah for its starting-point. As a result, all men throughout the civilized world render -- whether Christian or not -- involuntary recognition to Yeshua the Messiah. They acknowledge (even though it is most repugnant to them to do so) that YEHOVAH God’s doctrine has been the leading factor in shaping the course of human affairs for the last almost 2,000 years, and that the birth of the Messiah into this world was the beginning of an entirely new order of things among men. In retrospect, we cannot fail to observe that the spiritual powers or agencies which have had the chief part in shaping the course of the affairs of YEHOVAH's people Israel from the dawn of this era until now, have been FOUR in number. Not only that, but a careful examination of these powers or agencies show that they correspond respectively -- and in the precise order in which they arose -- to the symbolical representations of the four horses and their riders in the book of Revelation. The resemblance is so clear in each case that it is readily seen when pointed out -- and no twisting or manipulation of the meaning of the symbols is needed to produce the true explanation as YEHOVAH God intended. This unique correspondence between the broad characteristic marks of the Christian Era and the symbolical scenarios shown under the first four seals of Revelation is, in itself, STRONG PROOF of the correctness of the interpretation. The agreement is too complete -- and it extends to too many details -- to be attributed to mere chance. The visions of these four seals represent the going forth of mighty powers YEHOVAH God has used to shape the course of affairs throughout the entire age. They are to reach the very height of their activities in the closing days of this era, and show to us that the end is near -- even at the door! The word here rendered “pale” is chloros, from which the gas known as “chlorine” is named. It is of a green color. The word occurs in only two other places in the Book of Revelation, in both of which it is translated “green” (see 8:7 and 9:4). In Revelation 8:7 the Greek word chloros is applied to the earth's vegetation, and in Revelation 9:4 it refers to green things in the context of vegetation. While at first glance the significance of the color of the horse may not be as clear as in the other three horses, we can get some help from the rest of the verse for the name of the rider is plainly given -- DEATH. Moreover, Death is joined here with HELL, that is, Hades or the grave. The rider is “Death,” and his mission is “to kill”; and Hades -- or the grave -- is pictured as following with him to gather in, as it were, the victims. Since death has been busy in all parts of this world since the fall of man, it is evident that this passage has some other significant meaning. Therefore, “death” must here be the RESULT of some destructive spiritual influence that has been specially active in the gospel era. From what we have learned about the Black Horse the meaning of the GREEN Horse should not be too difficult to ascertain. It is a fact that Satan has the power of death (Hebrews 2:14); and we learn from the Parable of the Tares that after the sowing of the “good seed” of the gospel (represented by the WHITE Horse), the enemy was to come and sow tares (a FALSE gospel) among the wheat. In explaining the parable Yeshua the Messiah said that “the enemy” who sowed the tares “is the Devil” (Matthew 13:24, 25, 38, and 39). This was the FORCE behind the ride of the BLACK Horse. Since the four horses represent respectively the four spiritual agencies that have chiefly influenced and determined the character of “Christian” civilization, and that the first horse and rider represent the gospel of YEHOVAH God, then the Messiah’s teaching would lead us to expect something going forth to COUNTERACT the true gospel, something representative of some special form of Satanic activity corresponding to the going forth of “the enemy” into the field (world) after the Messiah and the apostles sowed the good seed therein. This was accomplished by the ride of the GREEN Horse. The going forth into the world of YEHOVAH’s gospel necessitated a complete change of tactics on the part of the “enemy.” Satan’s devices, which had served to keep the nations in the darkness and corruption of rank paganism would serve no longer. Other means must therefore be adopted; and the course of the gospel must be observed and followed with something specially adapted to counteract its influence and nullify its effects. The effect of the gospel is to impart LIFE; but the purpose of Satan is “TO KILL.” Those who obey the Messiah in faith are gathered into the Kingdom of YEHOVAH God where “grace reigns unto eternal life.” In contrast with this, DEATH is accompanied by Hell, or the grave, into which its victims are gathered. The gospel is “the word of TRUTH” so, by way of contrast, the Black Horse represented the most deceptive form of "the lie" Satan would employ for his ends (II Thessalonians 2:12). So now a completely different form of teaching, some grotesque imitation of the gospel, a religion that completely corrupts and perverts the true gospel of YEHOVAH God was initiated by Satan. What could this other "gospel" be? With the powerful resurgence of Islam in the world today, many people are puzzled why the Bible apparently makes no mention of a movement that holds sway over one-quarter of the world's population. Would you be surprised to learn that the official color of Islam is green? And is it possible that this relates in any way to the Green Horse of Revelation 6:8? Could the Green Horse be a prophetic symbol of Islam? Islam certainly fits into the pattern of the previous three world movements symbolized by YEHOVAH's true religion, strife and persecution that followed in the wake of the true gospel message and the going forth of a corrupt and deceitful gospel impelled by the Roman Catholic Church. Let's look at the entire prophecy about the Green Horse: "And I looked, and behold, a PALE [GREEN] HORSE. And the name of him who sat on it was DEATH, and HADES followed with him. And power was given to them over A FOURTH OF THE EARTH, to KILL WITH SWORD, with HUNGER, with DEATH, and by the BEASTS OF THE EARTH." Since the color of the horse can legitimately be translated as green, and since the official color of Islam is green, that aspect of the prophecy certainly fits. In 1878 Littell's Living Age magazine published an article entitled, The Green Flag of the Prophet in which the author revealed the origin of the banner belonging to Muhammed -- founder of the Muslim religion. Muhammed's banner was green; and it was written that Muhammed, gazing out upon a vast panorama of fields, declared: "Nature is green, and green shall be my emblem, for it is everlasting and universal." "The Banner of the Prophet (Mahomet): What purports to be the actual standard of Mahomet (Mohammed) is preserved in the Eyab Mosque of Constantinople (now Istanbul). It is called the Sinjaqu 'sh sharif. It is made of four layers of silk, the top-most being green, embroidered with gold. In times of peace it is guarded in the hall of the 'noble vestment' as the dress worn by the prophet is styled. In the same hall are preserved the sacred teeth, the holy beard, the sacred stirrup, the sabre and bow of Mahomet." The Islamic prophet is said to have worn a green cloak and turban, and his writings are full of references to the color. A passage from the Quran describes paradise as a place where people "will wear green garments of fine silk." One hadith, or teaching, says, "When Allah's Apostle died, he was covered with a Hibra Burd which is a green square garment." As a result, you'll see green used to color the binding of Qurans, the domes of mosques, and, yes, campaign materials. "The raising of the green standard is a call which none may disobey, without sacrificing, as the Koran calls it, all hopes of Paradise. "It is a summons to an anti-Christian crusade, a challenge of every believer in the Prophet to arms; a war-signal in fact, which, like the fiery cross of Scotland, would flash its dread command through the domain of Islam. In the interests of humanity, however, we may hope that the 'commander of the faithful' will never utter the dreadful word; for then indeed would the whole soul and strength of Christendom turn against the enemy of all civilized laws, human and divine. "The Prophet himself predicted that one day when his followers should number a hundred millions -- which they do now, with twenty millions more added to it -- his flag should fly against the advancing power of the northern races; and the Koran, or Mohammedan Bible, says that when its silken folds are flung forth 'the earth will shake, the mountains melt into dust, the seas blaze up in fire, and the children's hair grow white with anguish." Green comes up a lot in Islamic history. It was the color of the flag of the Fatimid Caliphate, the last of the four Arab caliphates. During the crusades, Islamic soldiers wore green to identify themselves. (Likewise, crusaders avoided green in their coats of arms, just to be safe from friendly fire.) Some say the banner under which Muhammed fought in the war on Mecca was green with golden trimming. (The flag is currently locked away in the Topkapi Palace in Istanbul, Turkey.) For centuries in Persia, only descendants of Muhammed, known as the Sayyids, were allowed to wear green turbans -- anyone else would be punished for it. Green was also favored by the Ottoman Empire, which after the Tanzimat reforms of the mid-19th century dyed its secular flags red and its religious flags green. In September 2006 WorldNetDaily.com reported that an influential Islamic preacher in Gaza -- Sheik Abu Saqer -- declared that "the day will come when the GREEN FLAG OF MUHAMMED will be raised upon the Vatican and all around the world." This is in direct conflict with the TRUE ensign, the flag of YEHOVAH God, Yeshua the Messiah! Six times the book of Isaiah calls the Messiah an ensign (a banner or flag). YEHOVAH God "will lift up an ensign to the nations from far, and...they shall come with speed swiftly" (5:26). The Messiah is the TRUE flag of YEHOVAH God, and when they return, his presence will be infinitely more significant than the flag of Muhammed! Muhammed founded Islam in Mecca, in what is now called Saudi Arabia. Saudi Arabia is 100% Muslim, and lives under Sharia (Muslim) law. 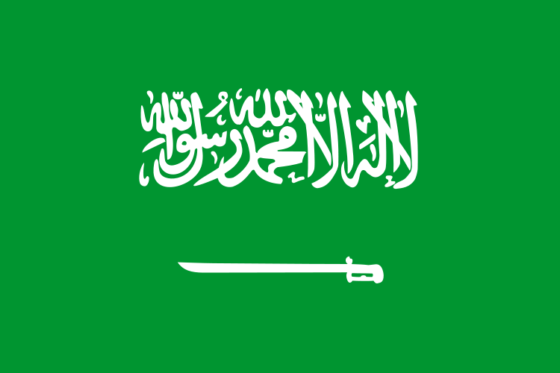 In the Saudi flag above, we can see three things: 1) Green background, 2) a sword, and 3) the Arabic inscription "No god but Allah, and Muhammed is his prophet." Make no mistake about it -- Islam has NEVER been a religion of peace. It is a religion of the sword. 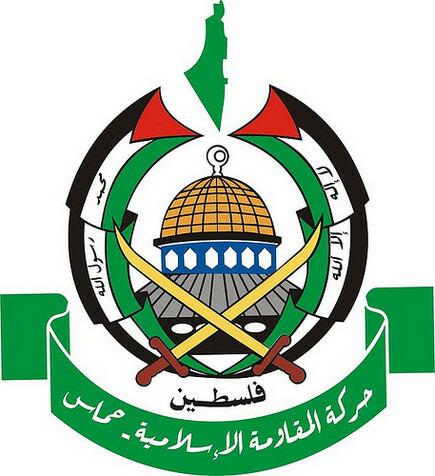 The flag of the Muslim extremist group, Hamas, has a green banner, the crossed swords and the Jerusalem mosque. These are the winners of the 2006 elections in the Palestinian Authority, and are warring for the annihilation of the State of Israel. They have completely taken control of the Gaza Strip in defiance of their own government, led by Fatah -- another terrorist group founded by the late Yasser Arafat. 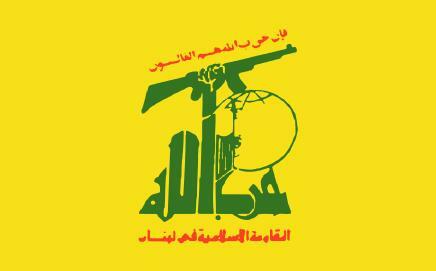 The Hezbollah flag has the name "Allah" in Arabic holding an automatic weapon. Syria sponsors this group. Hezbollah is the terrorist arm of Syria -- wreaking death and destruction in Southern Lebanon and Northern Israel. The flag of Iran has green for Islam, white for peace(!) and red for (are you ready for this?) -- courage! The symmetrical inscription says, "No god but Allah!" President Mahmoud Ahmadinejad of Iran, fueled by his Muslim extremist spiritual adviser Grand Ayatollah Ali Khamenei, has repeatedly sworn Iran and Islam to the death and destruction of both Israel and the United States. He publicly pledges to "wipe Israel off the map." In 2001 Khamenei said of Israel, "this cancerous tumor of a state should be removed from the region." And this is the religion of peace? Never was, never will be. Muslim clerics cynically boast that the West loves life, but that "Islam loves death." This is consistent with John's prophecy. They teach their followers that the most glorious path to paradise is martyrdom -- death by killing others while performing the act of suicide. The rider of the Green Horse was Death. Islam has become synonymous with death due to its dreaded suicide bombers. Almost daily we hear reports of deadly suicide attacks in Israel, Iraq, Spain or London. Islam teaches that the shedding of ones own blood in martyrdom in the name of Allah is how they are accepted into heaven. This is in COMPLETE CONTRAST with the redeeming blood of the Messiah that was shed for the remittance of all sins so that through him we are accepted into the Kingdom of YEHOVAH God. Satan has Muslim terrorists believing that when they commit an act of suicide killing they will be rewarded with paradise when, in fact, they are immediately sent to the grave. If not repented of, "all murderers will have their part in the lake of fire" (Revelation 21:8). When a Muslim sacrifices his life in the name of the FALSE GOD OF ALLAH, he is dying in his sins! This deadly, soul-destroying lie -- in various forms -- has followed the track of the gospel in every part of the field -- and from the days of Muhammed until now. Wherever the WHITE Horse and his rider have gone, the RED and BLACK Horses have followed, with the GREEN Horse and his rider tagging along in the rear with hell or the grave as his companion. DEATH and the GRAVE were the natural results for those who refused to partake of the heresies of the Green Horse! Death is the trademark of the GREEN HORSE -- just as death is the trademark of Islam. Can anyone question the accuracy of the prophecy when Islam today is associated around the world with the nearly 3,000 deaths in the New York's World Trade Center attack of 9-11-2001, and more than 8,000 subsequent Muslim bombings around the world since that time? Where is this so-called "religion of peace"?? "When one thinks of mass murder, Hitler comes to mind. If not Hitler, then Tojo, Stalin, or Mao. Credit is given to the 20th-century totalitarians as the worst species of tyranny to have ever arisen. However, the alarming truth is that Islam has killed more than any of these, and may surpass all of them combined in numbers and cruelty. "The enormity of the slaughters of the 'religion of peace' are so far beyond comprehension that even honest historians overlook the scale. When one looks beyond our myopic focus, Islam is the greatest killing machine in the history of mankind, bar none. 'The Islamic conquest of India is probably the bloodiest story in history' (Will Durant, as quoted on Daniel Pipes site). "Conservative estimates place the number at 80 million dead Indians. 'According to some calculations, the Indian (subcontinent) population decreased by 80 million between 1000 (conquest of Afghanistan) and 1525 (end of Delhi Sultanate)' (Koenrad Elst as quoted on Daniel Pipes site). "80 Million?! The conquistadors' crimes pale into insignificance at that number. No wonder Hitler admired Islam as a fighting religion. He stood in awe of Islam, whose butchery even he did not surpass. "Over 110 Million Blacks were killed by Islam. '...a minumum of 28 Million African were enslaved in the Muslim Middle East. Since, at least, 80 percent of those captured by Muslim slave traders were calculated to have died before reaching the slave market, it is believed that the death toll from 1400 years of Arab and Muslim slave raids into Africa could have been as high as 112 Millions. When added to the number of those sold in the slave markets, the total number of African victims of the trans-Saharan and East African slave trade could be significantly higher than 140 Million people' (John Allembillah Azumah, author of The Legacy of Arab-Islam in Africa: A Quest for Inter-religious Dialogue). "Add just those two numbers alone together, and Islam has surpassed the victims of 20th-century totalitarianism. However, it does not end there. Add the millions who died at the hand of Muslims in the Sudan in our lifetime. "Much of Islamic slavery was sexual in nature, with a preference for women. Those men who were captured were castrated. The mulatto children of the women were often killed, which explains why Islam was not demographically shifted towards the black race, unlike slaves in the West, who bore children to breed a mestizo class. Add in those dead children; and we arrive at well over 200 million" (American Thinker website). Although the numbers are certainly not clear, there is no doubt they are conservative. What is obvious is that Islam is the greatest murder machine in the history of the world -- bar none -- with the total more than likely exceeding 250 million dead. "Possibly one-third to one-half or more of all those killed by war or slavery in history can be traced to Islam; and this is just a cursory examination!" (The Greatest Murder Machine in History). So between Black Horse of Roman Catholicism and the Green Horse of Islam, at least 300 million people have been put to death during the last 2,000 years by the forces of Satan! The spirit of the Green Horse is described as having power over the fourth part of the earth. How does this square with today's population demographics? Estimates of the followers of Islam by country -- based on U.S. State Department figures -- yield a total of 1.48 billion (Wikipedia Encyclopedia). This would be exactly one-fourth of the world's population. Another source states: "A comprehensive 2009 demographic study of 232 countries and territories reported that 23% of the global population, or 1.57 billion people, are Muslims. Of those, it's estimated over 75–90% are Sunni and 10-20% are Shi'a, with a small minority belonging to other sects. Approximately 50 countries are Muslim-majority, and Arabs account for around 20% of all Muslims worldwide. Between 1900 and 1970 the global Muslim community grew from 200 million to 551 million; between 1970 and 2009 the Muslim population increased more than three times to 1.57 billion." Satan has used various destructive agencies, not the least was the sword. John 6:8 says that the people of the Green Horse are to kill with the sword. It has been a long tradition within Islam to kill with the sword for centuries -- even in these modern times. When they behead infidels, it is with the sword. And, as we have seen, the symbol of the crossed swords is on many of their flags. The Greek word for sword in John 6:8 actually means "long sword," which eliminates the armies of Rome as being the source of this prophecy. The legions of Rome carried the short sword -- and were famous for their competency in the use thereof. On the other hand, the forces of Islam carried the long sword, enabling them to kill their adversaries from horseback. All the historical references agree that the forces of Islam carried the long sword. To kill with HUNGER -- many of the governments and leaders of the Islamic nations in the Middle East and Africa purposely oppress their people in poverty and hoard the wealth to themselves hence, killing with hunger and death. Islamic countries are known for the proliferation of violence, poverty and disease. Recently Mohammad Abbaspour, a member of Iran's Majlis (parliament), said that at least 90 percent of his country's population is under the poverty line: "90 percent of the population are living under the poverty line and only ten percent of the people have access to social services provided by the government". He stated this in an interview with a hard-line state-run news agency. "The Ministry of Housing has built many accommodations but we must ask this ministry, how many of these constructions built are housing poor people", the Majlis deputy from Urumiyeh (northwest Iran) said. Abbaspour warned that Iran was becoming a country with vastly separated social classes: "In the past 25 years…we have witnessed immense pressures in society, indicating social injustice. This phenomenon has led to the rise of social ills such as homeless tramps, higher divorce rates, poverty, and prostitution. Abbaspour, a member of the Majlis Social Affairs Committee, blamed the government for turning a blind eye to pervasive corruption in Iran. These same problems can be found in many of the Islamic nations. The word "beasts" in Revelation 6:8 is actually in the singular in the Greek, so the phrase should read "Beast [singular] of the earth” -- see A Greek-English Lexicon to the New Testament by W. C. Taylor, Strong's Exhaustive Concordance of the Bible, The Kingdom Interlinear Translation of the Greek Scriptures, etc. Keeping in mind the axiom that we should let the Bible interpret the Bible we find mentioned, in Revelation 13, a "beast coming up out of the earth, and he had two horns like a lamb and spoke like a dragon" (13:11). What is this referring to, what is this "beast" coming out of the earth or ground? Earlier, in Revelation chapter 9, John saw an army of locusts come out of the smoke that issued out of the bottomless pit. So, what was John talking about when he described the army of locusts? Christians of the past, who knew history better than most of us do, saw this army of locusts as a prophecy of the rise and spread of Islam. "They begged Yeshua not to order them to go off into the Bottomless Pit (abyss)." "The Bottomless Pit, or Abyss, symbolically represents the abode of darkness and evil, the antipathy of heaven, the source of light and power. From this abode of darkness and evil COMES A MONSTER that is able to accomplish what Papal Rome was never able to do....The king over the Saracens is called Apollyon (meaning destruction, destroyer) and is the angel of the Bottomless Pit. Thus again Mohammedanism [Islam] is identified with the Saracens who compelled men to accept the authority of the Caliphate or suffer destruction..." (A Study in Revelation, p. 136, 93). The term "bottomless pit" also denotes the place from whence Islam thrust itself upon the world of the time. This term comes from the Greek word abussos, and signifies a waste, desolate region. A brief sketch of Arabia makes plain the significance and aptness of the term as applied to that country. "The entire surface of the peninsula exceeds in a fourfold proportion that of Germany or France; but the far greater part has been justly stigmatized with the epithets of the stony and the sandy. Even the wilds of Tartary are decked, by the hand of nature, with lofty trees and luxuriant herbage; and the lonely traveler derives a sort of comfort and society from the presence of vegetable life. But in the dreary waste of Arabia, a boundless level of sand is intersected by sharp and naked mountains; and the face of the desert, without shade or shelter, is scorched by the direct and intense rays of the tropical sun. Instead of refreshing breezes, the winds, particularly from the southwest, diffuse a noxious vapor; the hillocks of sand which they alternately raise and scatter, are compared to the billows of the ocean, and whole caravans, whole armies, have been lost and buried in the whirlwind. The common benefits of water are an object of desire and contest; and such is the scarcity of wood, that some art is requisite to preserve and propagate the element of fire." "Arabia is destitute of navigable rivers, which fertilize the soil, and convey its produce to the adjacent regions; the torrents that fall from the hills are imbibed by the thirsty earth; the rare and hardy plants, the tamarind or the acacia, that strike their roots into the clefts of the rocks, are nourished by the dews of the night; a scanty supply of rain is collected in cisterns and aqueducts; the wells and springs are the secret treasure of the desert; and the pilgrim of Mecca, after many a dry and sultry march, is disgusted by the taste of the waters, which have rolled over a bed of sulphur or salt. Such is the general and genuine picture of the climate of Arabia" (The Decline and Fall of the Roman Empire, chapter L, par. 2). "Like the noxious and even deadly vapours which the winds, particularly from the southwest, diffuse in Arabia, Mahometanism spread from hence to its pestilential influence -- arose as suddenly and spread as widely as smoke arising out of the pit, the smoke of a great furnace. Such is a suitable symbol of the religion of Mahomet, of itself, or as compared with the pure light of the gospel of Jesus. It was not, like the latter, a light from heaven, but a smoke out of the bottomless pit" (Vol. I, p. 299). The army of locusts came forth from a dark cloud of smoke that rolled out of the bottomless pit. The "bottomless pit" in Greek is abussos, the source of our English word abyss. Some English Bibles simply translate it "the abyss." It is remarkable that Abul A'la Mawdudi, one of Islam's most prominent scholars of the 20th century, used the very word abyss when writing about the beginnings of Islam. In a book written to introduce English-speaking people to the basics of Islam, Mawdudi tells his readers that Muhammad and his message came out of "Arabia -- the Abyss of Darkness." These are his exact words, and they appear in bold print as a sub-heading in his book. It is no mere coincidence that this outstanding Islamic author unwittingly identified Islam's source, in bold print no less, as "the Abyss of Darkness," using the very same word that appears in Revelation. As we saw a Muslim writer unwittingly connect Islam's beginnings to the Abyss, here we see Muslim writers unwittingly connect Islam to the locusts that come from the Abyss. "Then I saw another beast coming up out of the earth [abyss]; and HE HAD TWO HORNS like a lamb and spoke like a dragon." What is this two-horned governing beast? Among the 6,666 verses of the Qur'an (Koran) -- the sacred book of Islam -- are found the words "Dhul-Qarnayn," which literally mean "He of the two horns." This is found in verses 18:83 to 18:98. It tells the story of the two-horned one who will take the religion of Islam from the East to the people of the utmost West. It will then be determined by the two-horned one whether to show kindness to the people or to punish them -- depending on whether or not they will accept Islam. We also know that the great symbol of Islam is the crescent moon with two sharp horns. Has the two-horned beast risen up from the earth in the Western nations, including the United States? It is a dark, Satanic religion that demands the death of all who will not convert to it. It is a religion of fierce cruelty that also has another symbol -- the scimitar or curved sword. It is a religion of beheading, terrorism and bloody torture. "Verily, Allah forgives not the sin of setting up partners in worship with Him, but He forgives whom He wills sins other than that. And whoever sets up partners in worship with Allah, has indeed strayed far from the path" (4:116). The "people of Shirk" in the passage above are, therefore, the people of those who support polytheism -- in other words mainstream paganized "Christianity" that is prevalent today. In Zechariah 6 we find the origin or prototype of the four horses of Revelation -- notice! In the reference above the fourth horse is called "dappled. "Dappled" is not a color, but a texture (spotted or splotched). The Hebrew word that is translated "dappled" here is not used anywhere else in the Bible. It is an uncertain term that more accurately means "strong or courageous." Therefore, when we combine what we know about the fourth horse from both Zechariah and Revelation, we see a "strong, courageous green" horse. The universally identifiable color of Islam is green. Look at virtually anything that has to do with Islam and you will see GREEN -- and it is definitely STRONG, COURAGEOUS! It is interesting to note that the Red Horse is not mentioned going to any particular country -- which is consistent with what we learned about the Red Horse of Revelation 6! The White and Black horses went north, and eventually north-west, which is where true Christianity, followed by the false "Christianity" of Catholicism, went. The passage then says that the fourth horse went into the south country. This, too, is amazingly accurate since over 96.5% of the world's Muslims live in Africa and southern Asia -- and Islam's capital, Mecca, is south of Israel. "The footage, provided by Euronews and subsequently seen on MSNBC, CNN and uploaded over a dozen times to the popular video sharing site YouTube, captures the fiery, violent protests in Cairo this past week … and something else. "Between the crowds of protesters and barricades, the video shows a flowing, pale green image that resembles an erect rider atop a horse in Medieval-like barding. The ethereal figure remains for a few moments before floating over protesters’ heads and off the screen. "The last of the biblical Book of Revelation’s Four Horseman of the Apocalyse, the “pale rider” is said to be the bringer of death and the forerunner of “hell” on earth. "The Book of Revelation refers to a time when “the Lamb” -- usually understood to be the Lamb of God, Jesus Christ -- opens the seven seals of a scroll of judgment. Each of the first four seals is accompanied by a horseman of a different color, each bringing a separate calamity. "Is the image from Egypt a fulfillment of Revelation’s prophecy? "Comments from the tens of thousands of viewers who have watched the video on YouTube express a wide array of opinion. "Some claim the video’s “pale rider” is a sign and the greenish tint is somehow symbolic of Islam, while others insist the image has been added to the footage by editing technology. Still others point to three, trailing points of light in the footage that move away from the crowds at the same time and speed as the “horseman,” indicating that both the “rider” and the lights are merely smudges or reflections cast on the lens of a moving camera. I can not tell you if it is a quirk in the camera, or a purposely done trick. Or even something supernatural in nature or even perhaps man using a hologram. Perhaps it is Satan coming with his lying signs or wonders. Perhaps it is what it appears to be. I cannot say. Whatever it is, it is very convincing specter of a horse and rider. Strange indeed when you consider all the information above! The four living creatures, who are associated in a special way with YEHOVAH’s purposes in the new creation, are definitely related to the action of the four horses and their riders. This further confirms the fact that what YEHOVAH has revealed to us here are the symbols of the four major spiritual agencies, whereby the character of this age has been largely determined. The first and greatest in its effect is the TRUE gospel (the WHITE Horse) -- through which YEHOVAH God is acting upon the world directly through His Word and spirit. By the other three the effects of the Messiah’s coming into the world act upon it indirectly. For the strife and variance (the “sword”) which he said he would send throughout the earth (the RED Horse), were provoked by the true gospel, and have always and everywhere followed in its wake. Likewise the powerful influence of the propagation of a commercialized and perverted gospel by Satan’s campaign of venomous lies, murderous heresies, suppression of the Scriptures and stirring up the hatred of governments against the true gospel (the BLACK Horse), has led to the great harvest of the GREEN Horse of DEATH and the GRAVE. If you are at all observant you will realize that the color scheme of the horses shows a progression downward, ending in darkness and death. This, of course, is “according to the course of this world” (Ephesians 2:2). But YEHOVAH God’s order reverses this. He finds us in a state of death and darkness, and raises us up to the brilliant light of His Word, bringing us to the time when YEHOVAH “will wipe away every tear” from our eyes, and to the time when “there shall be no more death, nor sorrow, nor crying; and there shall be no more pain, for the former thing have passed away” (Revelation 21:4). This is the time when YEHOVAH God the Father Himself will once again dwell with His people Israel, “and they shall be His people, and God Himself will be with them and be their God” (21:3). Satan has done a superlative job, for even today the very Churches of God are thoroughly confused over the meaning of the Book of Revelation. Many believe the White Horse and its rider represent false religion -- an interpretation that is thoroughly refuted by the Bible. Others believe that with Bin Laden and President Obama we have entered into the time of the Red Horse, while others believe it represents coming wars that will precede the end of the age. According to some the Black Horse represents famine or global inflation -- or a connection with the black uniformed SS troops of Nazi Germany!! The majority believe the Green Horse represents plague or pestilence -- but the original Greek does not say that! The word translated “plague” in some versions of the Bible is also translated “death” in others. Revelation 6:8 clearly defines the Green Horse by naming it “Death”! While plague or pestilence can certainly be the outcome of persecution by those promoting false religion, this is NOT the main thrust of the ride of the Green Horse. Only when you interpret scripture with scripture can the TRUTH regarding the four horsemen of the Apocalypse be revealed. Hope of Israel Ministries -- Preparing the Way for the Return of YEHOVAH God and His Messiah to Set Up the Kingdom of YEHOVAH God Here On This Earth!